Last week, it was my great pleasure to pay a return visit to the Mezquita in the UNESCO Historic Centre of Córdoba, where I was delighted to capture these dazzling sunbeams making their geometric patterns against the famous red and white arches. This post is my response to the WordPress Photo Challenge: GEOMETRIC ; Travel Theme: BRIGHT and this week´s Sunday Post: WONDERFUL. This entry was tagged Andalucía, culture, Europe, history, photography, Post a week, Religion, Spain, Sunday Post, travel, Travel theme, weather, Weekly Photo challenge. Bookmark the permalink. This photo is amazing. But I bet that the atmosphere in that place was simply incredible. Sunlight creates such ethereal effects! Love the sun beams. It’s like heaven opened and bliss came through. Beautiful! Yes, there is an ethereal quality about it, isn´t there? Thanks for your lovely comments and continued support for my blog. It´s always much appreciated. Whenever I see sunrays in a house of worship I always think of God atop the clouds overhead. What a glorious photograph! Thanks for your encouraging comment – much appreciated. 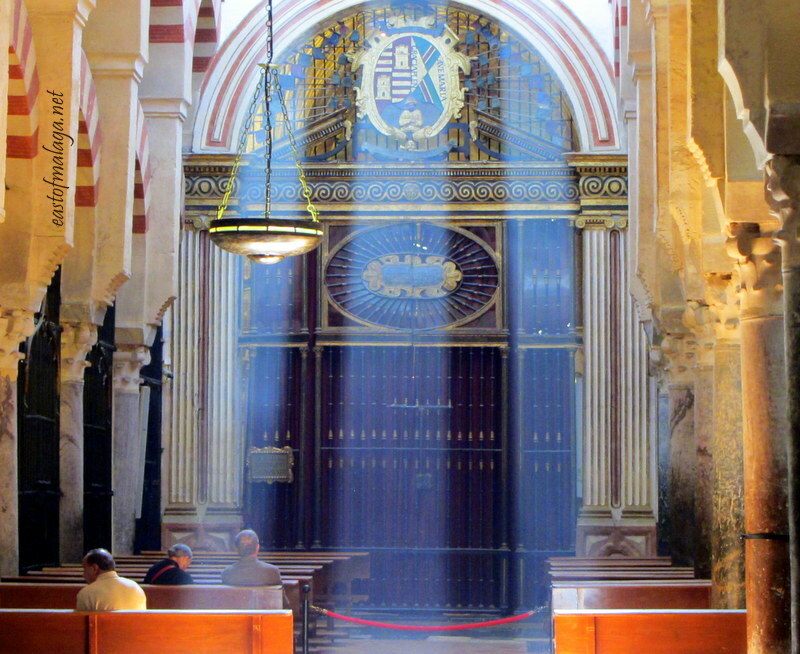 Fantastic photo Marianne, really captures the mezquita at it´s best, the lightbeams are fantastic, very creative photo! Makes me feel lucky to live near such a beautiful building! You are right…your photo captured a magical moment. Very nice catch! Sunrays illuminating churches are always symbolical of how nature works in mysterious ways. I agree Marianne 🙂 It is wonderful as well 🙂 I did it once long time ago – put one post for two challenges :D. When are you off to Aussie land? Those shafts of light really are wonderful! Fabulous photo. Mystical as well as geometric! An exquisite and wonderful photo, both because of the natural golden and blue light versus the man-made structures. I agree – most ethereal, particularly considering where the picture was taken. You’re welcome! I’m always happy to visit. Am a little behind now because I was away in Ethiopia, but I WILL catch up! It´s wonderful to have you back, Jake. Thanks Madhu, it made me realise that I´m really starting to think about the images I capture (and want to capture). I’ve been to Cordoba twice, did I miss this? I love Spain. Did you? It´s surely difficult to miss. Ooh, let’s see some more sunbeam shots, Marianne! Cordoba is one of my favourite places,too. It was a lucky strike! This picture has a real ethereal quality to it! wow….just wow!! truly an amazing shot!! See how bright my smile is at that idea of yours! x I won’t go on anymore . Brownie Promise. Ah yes – “Beam me up, Scotty”! Ahhh…Big Man and I had our first “date” (feel a bit old to use that word!) in Cordoba and seeing this post bought back many happy memories! awe, that is so sweet!!! Me encanta Cordoba…..
It´s a very romantic place – all that history just seeping out of every wall! Wow, Marianne! How beautiful is that? Morning Gilly – you´re up early. Are you an early riser, like me? Great photo Marianne………and a lovely place. Me too, Richard. I love the straight lines of the natural sunbeams against the curve of the arches. The flaring light streaming in from above could be seen as spoiling the shot – i think it adds to it!